When the rain and the snow fall, the wind blows, and the temperature drops, we don protective outer garments out of necessity. For the tailored man, the outer layer of choice will be the overcoat: a heavy, knee-length coat with a collar and lapels. 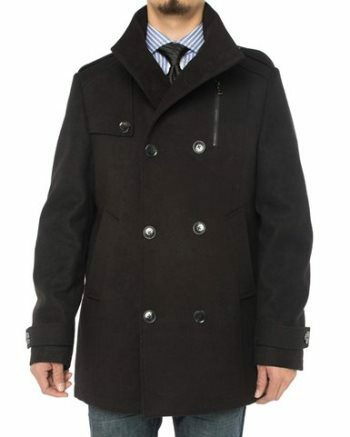 In the colder months, the overcoat is an easy style move that distinguishes the well-dressed from the dressed up. However stately a man’s suit, if he walks in off the street with a ski parka covering it, the parka will define the first impression he makes and the suit will look discordant when it comes into the light. On the other hand, when you walk in draped in a knee-length coat with your scarf smartly knotted around your neck, you make a distinguished impression that will stick even if you take it off to reveal a polo shirt and blue jeans. Of all the garments we wear, the overcoat has perhaps changed the least over the past century, so that one of high quality is truly a long-term investment. The single-breasted overcoat is the most common, and for good reason. On bright fall and winter days, it can be worn without a scarf, or with one just trimming the lapels, to display your shirt and tie. In the freezing wind and snow, double your scarf around your neck and turn the collar up for protection from the elements. 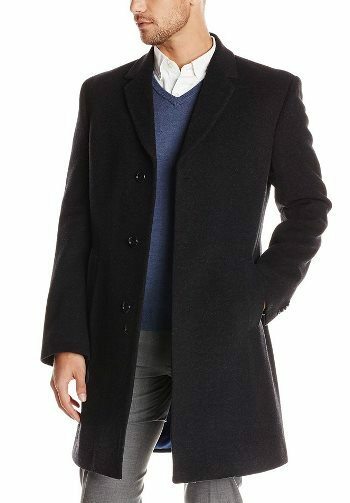 Besides the single-breasted standard, overcoats may be double breasted, with or without a belt. The belted model is sometimes called a polo coat. Black, charcoal, and navy blue will each frame any shirt and tie you have on underneath. Should you tire of wearing the same dark overcoat day after day, there are other options. Camelhair has long been a favorite of the New England aristocracy, thanks to its incomparable troika of warmth, durability, and softness. Given its pedigree, the natural beige color of pure camelhair is exempt from the traditional rules of color matching for formality’s sake, although all materials are equal before the judgment seat of aestheticism. Checks are traditional for fall and spring weight coats, and can be found on heavier ones as well; for the gentleman who enjoys mixing and matching patterns they offer an opportunity to add another ingredient to the stew. Subtle horizontal stripe patterns are as versatile as solids, and give one a dandified touch. The particular coat one chooses should be first a question of insulation (you’ll need more the farther North you live), and second of personal style. If you are unsure where to start, you cannot go wrong with black; just find one that’s warm enough for you. The coats sold in stores are usually only available in even sizes, since their appearance is less sensitive to fit than that of a suit. Nonetheless, many men choose to order bespoke overcoats, since this allows for a perfect fit with accompanying superior insulation. If your body type is such that off-the-rack clothes never fit you, overcoats are likely no exception, and bespoke will be your best option.